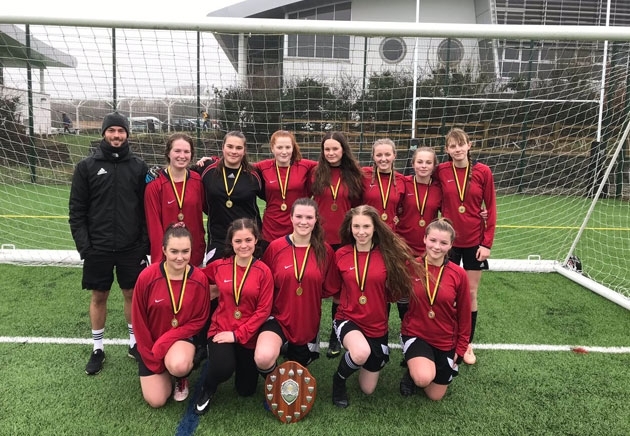 Saltash.net’s under 16 girls’ football team has been crowned County Champions for the fifth time in six years after beating Richard Lander School 2-1 in a closely fought final. The goals came from Ellie Maunder and Hollie Congo, supported by a fantastic team performance and a great debut game in goal for Alesha Adams, who replaced injured regular Merryn Richmond. Alesha, having never played in goal before, stepped up to the position where mistakes can be very cruelly highlighted and pulled off a string of great saves to keep saltash.net in the lead. Saltash.net had beaten Liskeard School and Bodmin College on the way to the final. Mr Budd, who coached the team, was delighted with the team’s performance. “This is a team that encompasses everything we encourage in terms of core values, sporting values and positive attitudes and they fully deserve their success. They are an absolute pleasure to work with,” he said.